A leader in the fields of periodontology and implantology, Dr. Richard K. Parris has provided quality, state of the art care for the residents of Orange, Anaheim Hills, Brea, Villa Park, Santa Ana and surrounding areas since 1983. He is a graduate of the UCLA School of Dentistry, has achieved hospital residency at USC/Country, and completed a residency in periodontics at Loma Linda University. 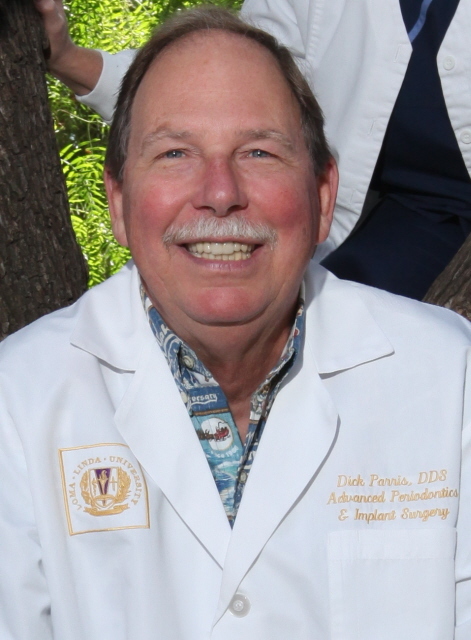 For 15 years, Dr. Parris served as an assistant professor of periodontics at Loma Linda University. This position allowed him to pass his knowledge and expertise in patient treatment to young graduate periodontal students. This close connection to the university granted him access to the latest clinical research and data, guaranteeing his patients the most up to date treatments available. Annually, Dr. Parris attends many continuing education courses in cosmetic, periodontal and implant dentistry, thus ensuring that he stays in the forefront of his field with all of the latest technological advances and studies. Being willing to embrace new technologies is an important aspect of successful periodontal practice.